Sweet Sketch Wednesday High Hopes Go Green! Thanks for visiting! I love reading your comments. Oh my Heidi, this is lovely. These are the most beautiful papers and colors - so rich looking. I love the distressing. And the image is colored so perfectly - I love the softness of it. Your creations are so outstanding and this is no exception to that. Thanks so much for sharing you creativity with us at Sweet Sketch Wednesday! Hi Heidi!!! Oh my, what a super sweet card!!! That is one adorable little bear holding that flower!!! I'll have to take a peek at Wild Rose Studio!!! Gorgeous papers and distressing. Thanks for joining us at SSW. Your papers are perfect with your image! I love the button brads you used too! Fabulous coloring too! Oh my goodness, your papers are gorgeous and your image is as sweet as can be. Your coloring is fantastic. One beautiful card. 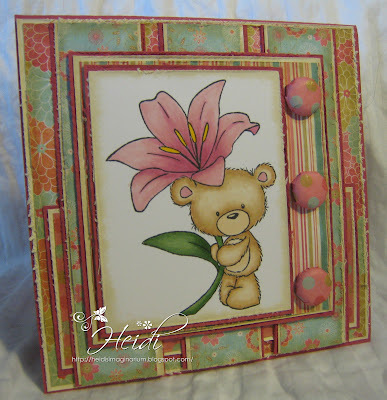 Hi Heidi, your card is so so pretty, I do love this image and your design papers are the most perfect choice and match. I do love your brads they are like the build a button I would make years ago, I would make my buttons with the same or contrasting material of my outfit. That was before the days of having children!!! Go the Black Caps they are playing South Africa next they say the pitch is suited to NZ's bowling rather than SA's. Well the proof will be in the pudding lets see who wins. Gorgeous colors and papers and the perfect coloring! Thanks so much for joining us at Sweet Sketch Wednesday.